Prisoners executed by lethal injection in the US may have been aware of what was happening to them, researchers claim. A team from the University of Miami looked at information on anaesthesia and awareness in prisoners. They suggest some suffer unnecessarily, and claim standards do not meet those for putting animals down. The researchers, writing in the Lancet, call for the use of lethal injection to cease to prevent "unnecessary cruelty". In America, lethal injection is the most common way that people are legally put to death, largely because it is seen as relatively humane and does not violate the US Constitution's Eighth Amendment, which prohibits cruel and unusual punishment. Prisoners are first given sodium thiopental, which acts as an anaesthetic before pancuronium bromide is given to cause paralysis. Potassium chloride is then given to cause death. Without anaesthesia, the person would experience suffocation and excruciating pain - but would not be able to move. The researchers collected information from the states of Texas and Virginia, where around 45% of executions in the US are carried out. They also interviewed officials involved in executions. It was found that most had no training in executions, and that drugs were administered without any direct observation, physical examination or electronic measurement. The researchers said that it appeared executioners assumed prisoners had been anaesthetised successfully if they were given the standard dose of thiopental. But they warn this might not be true if the drug is given incorrectly, or if the execution takes longer than anticipated. Anxiety or serious substance abuse can also affect how high a dose the prisoner needs. The researchers then analysed autopsy data for 49 prisoners who had been executed in Arizona, Georgia. North Carolina and South Carolina. They found that concentrations of thiopental in the blood were lower than that required for surgery in 43 cases. In 21 of those, the concentrations in prisoners' blood were consistent with them being aware of what was going on. Writing in the Lancet, the researchers, led by Dr Leonardis Koniaris, said: "We certainly cannot conclude that these inmates were unconscious and insensate. "However, with no monitoring and with little use of the paralytic agent, any suffering of the inmate would be undetectable." They add: "The absence of training and monitoring, and the remote administration of drugs, coupled with eyewitness reports of muscle responses during execution, suggest that the current practice for lethal injection for execution fails to meet veterinary standards." In an accompanying editorial, the Lancet said: "Capital punishment is not only an atrocity, but also a stain on the record of the world's most powerful democracy. "Doctors should not be in the job of killing." 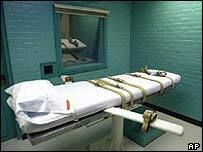 American Medical Association ethical guidelines bar physicians from taking part in executions. But a survey has shown that 19% were willing to inject lethal drugs.